Mensusa https://www.mensusa.com/articles/gold-vest-is-a-smart-choice.html Gold Vest Is A Smart Choice A gold vest is a smart ensemble that flatters an individual's personality and adds style to his casual as well as formal wear. It is an indispensable part of your wardrobe if you want to look different from others. A vest is considered to be a versatile attire that has been the choice of sophisticated men from a long time. It is a part of a three piece suit but can be worn separately too on casual occasions to look stylish and lively. There are different kinds of vests available at the renowned stores like MensUSA that differ in designs and colors. You will get the backless vests, tweed vests, paisley vests and other varieties. 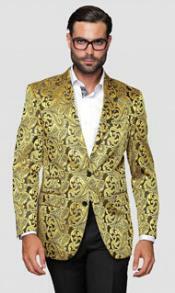 Whatever may be the occasion your vest will help you to steal the show especially when it is gold vest. Vests are indeed exclusive ensembles that are worn on various occasions. But when it is a special event, you must be selective about the color of your vest. What about a gold vest? It is perhaps the best option when you plan to wear a black tailcoat. A well-fitted gold vest will create an amazing look as the shade adds a royal touch to your complete suit. The vibrant shade easily attracts others and you can become the center of attraction at all gatherings. If the front buttons of the jackets or the coats are kept open, the inner gold vest is easily visible. Designers offer different cuts and fits so that you can comfortably match your vests with the suits that you wear. The fact is that the gold vest is so unique that you do not require any other accessories to look good. You naturally look smart. If you step into MensUSA when you want to buy a gold vest, you will be at a loss as to which shade you should buy for the store offers the largest variety of cuts, sizes and shades of gold vest. It is not necessary to purchase the bright golden color. You can wear the light gold vest with jacquard designs or the gold buff single breasted vest if the occasion is in the morning. Each shade has its own specific attractiveness that creates an authoritative look. The well-tailored six-button classic style gold vest adds a feather to your tuxedo suit. The golden shade is so versatile that it gives you a luxurious look even on formal occasions. The pale gold vest to the plain or patterned gold vests are the perfect choice for weddings, anniversaries and also birthday parties. However, add a suitable tie to look smarter. The single breasted gold vest that is embellished with six buttons and matching welt pockets on both sides is awesome and unique. The gold vest is light in weight for which you can show off your style during the summer months as well. A gold vest is a timeless classic ensemble that needs no exaggeration. You can opt for the gold leaf pattern, gold floral pattern, gold rose leaf pattern and others to make a mark of your own.